On Monday January 28th, the Nicolaas G. Pierson Foundation presented the book Sea the Truth, Essays on Overfishing, Pollution and Climate Change. The anthology is an addendum to the documentary Sea the Truth, that premiered in May 2010 in the Tuschinkski theatre in Amsterdam. 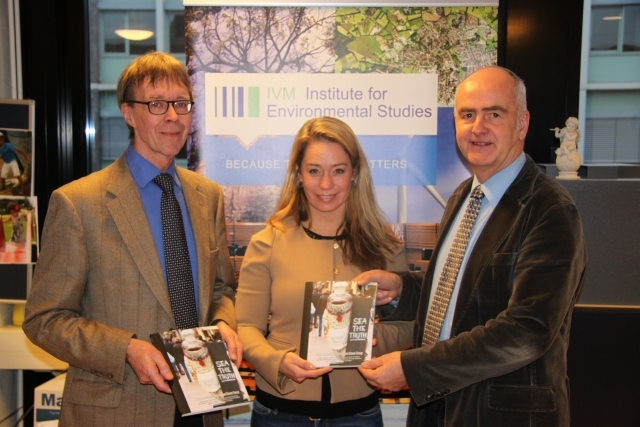 The first copies of the book were presented to Prof. Dr. Jacob de Boer, Head of the Institute for Environmental Studies (IVM) at the VU University in Amsterdam, and Dr. Harry Aiking. People often turn to eating fish to limit their meat consumption. Nutritionists propagate eating fish twice a week as it is packed with nutrition. These healthy nutrients are however easily obtained from other food sources, whereas fish may also contain large amounts of toxins. And, most important of all, the sea is not an unlimited cornucopia that we can continue to empty at will without serious repercussions. To address this, the Nicolaas G. Pierson Foundation decided a sequel was called for. The central focus of Sea the Truth is on the consequences of our hunger for animal proteins from our seas and oceans. All over the world, the oceans are seriously polluted due to plastic waste and chemical fertilizers. CO2 emissions caused by human activity and global warming are changing the chemical composition of the oceans, leading to increasing acidity of the water. As a result, the biodiversity in the oceans is under serious threat, the quality of the water is deteriorating and fish are poisoned. This anthology is intended as a companion and addendum to the documentary Sea the Truth. It is a selection of what has been published by scientists, NGO’s and journalists on overfishing, climate change and pollution of our oceans and it offers a more detailed insight into the main themes of the film. Sea the Truth: Essays on Overfishing, Pollution and Climate Change seeks to raise awareness of the necessity of a global reduction of catching and consuming fish. Moreover, it aims to stimulate the international public and political discussion of the deplorable state of our oceans. The book may be purchased in our webshop.